Posted on Saturday, April 7th, 2012 at 6:00 am. Subscribe to the comments feed. Both comments and pings are currently closed. Post on your own blog. 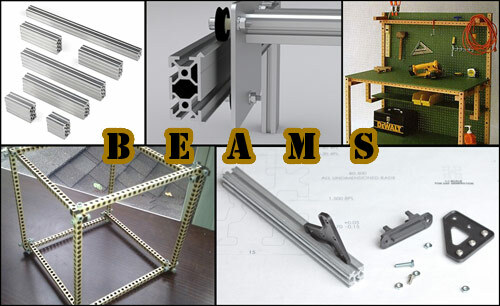 Grid Beam is actually older than that — Phil Jergenson, one of the guys behind Grid Beam, published an earlier version under the name “Box Beam” in 1994. See here. And Ken Isaacs was promoting a very similar system in Popular Science in the early 1970s– the difference being that you couldn’t buy them pre-made, you had to drill the holes yourself. And of course, don’t forget Mitsumi, 80/20, and Bosch for the bigger stuff. One more that I know is in beta testing right now, fully Open Source also is Contraptor. Thanks for the Contraptor tip, Justin! Thanks for the write-up! If there’s anything you’d like to see improved in bitbeam, just let me know!